Highly anticipated: If you're an avid PC gamer but you're on a tight budget, Steam's sales are probably the best times for you to tick some games off your wishlist. Fortunately, yet another one of the platform's massive discount periods has arrived, in the form of the Lunar New Year sale. This time around, Steam is celebrating the Year of the Pig, and it has plastered cartoon images of the creatures across its platform to make that clear. 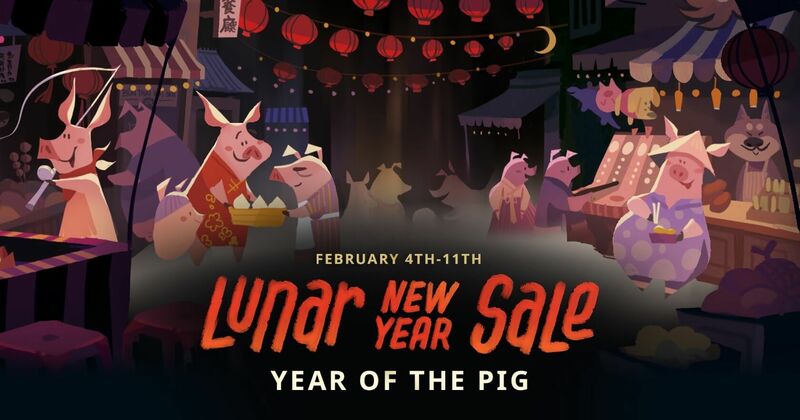 As is usually the case with Steam sales, the Lunar New Year sale has its own gimmick, which is designed to get you to spend as much cash as possible. For every purchase you make on Steam before February 12 (the sale's end date), you'll earn golden tokens. Golden tokens can be spent on a wide variety of rewards, ranging from Steam profile backgrounds to pig-themed chat emoticons and in-store discounts. Furthermore, it seems like everyone who logs in during the sale will automatically get some tokens (the amount seems to vary from player to player) to spend after opening a "red envelope," as well as a one-off $5 coupon on any order that costs more than $30. So, what about discounts that you don't have to earn? In true Steam sale fashion, virtually everything on the store is being discounted. These price cuts range from 20 percent all the way up to 85 percent, and this time around, it isn't just smaller titles that are getting the biggest cost reductions. Assassin's Creed Odyssey is on sale for $30, half of its original cost. If older (but still excellent) games are more your speed, the Witcher 3's GOTY edition is now $15, down from $50.